Meet Dr. Ating; resident physician at Green School on the island of Bali. When he’s not patching up skinned knees this mild mannered superhero is saving the world one species at a time through the Dr. Ating Foundation. Okay, so when I interviewed him he wasn’t wearing a cape or tights, just glasses and a great big smile. But, he is on a mission to save the native species that call Lore Lindu National Park in Sulawesi, Indonesia home. If someone doesn’t step and find a way to save these species there will be irreversible damage to our planet. Listen up, heed the warning and help out! How did the Dr. Ating foundation come to be? ~It start with a dream and the generous help of a Swedish family spending a year in Bali. I told them stories of the 10 years I spent living and working in the jungles of Papua. I was inspired by the work of the Rainforest Action Network and how one day I hoped to create a conservation program in Sulawesi that would benefit not only the plants and wildlife but the villagers living around the Lore Lindu National Park. The Gelin family saw the potential for our planet in this vision and helped me establish the foundation. We are currently looking for funding. 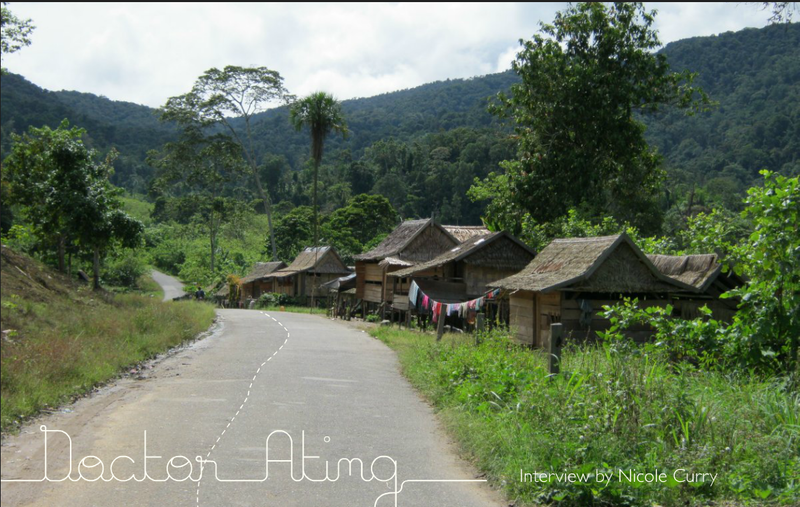 What are the goals of the Dr. Ating Foundation? ~The first goal is to create trust with the local people of Lore Lindu by establishing the first ever Health Care-for-Nature swap. No one can protect the habitat of wildlife better than the native peoples living in the forests. Unfortunately, they are very poor; their livelihood depends on the extraction of forest products, including endangered wildlife. For the forest dwellers traditional conservation programs are suspect, they fear that conservation will cut off their access to the current sources of their livelihood. By addressing both health care and financial benefits of local people the wildlife in the forest will receive increased protection by local residents who see long term advantages to helping preserve the Park. We hope to pilot a successful model of local community engagement that could be replicated in other protected areas around Indonesia and the world. What are the biggest obstacles the foundation will face with Lore Lindu people? ~The anticipated major obstacle will be too many people coming for the health service when the financial and personnel resources are still limited; the other issue will be helping the people understand that they have an obligation to “swap” the health services we offer with preserving the rainforests and stop poaching wildlife. ~Sulawesi has evolved a strange mix of plants and animals displaying staggering levels of endemism (found no where else on Earth…(don’t feel bad I didn’t know what it meant either!)) Some of the largest unbroken tracts of forest on all of Sulawesi are found in the Lore Lindu National Park, which provides a vital biodiversity corridor linking all of the remaining forest areas on the island. The Park is recognized as an international center of plant diversity and endemic bird area. Nearly 40% of the 400 species of birds living in the park are only found here. Lure Lindu was declared a biosphere reserve by the UNESCO in 1977. * check out these cute little Pygmy Tarsiers found no where else in the world! They were thought to be extinct since the 1920’s but, 3 of these tiny fuzz balls we’re found to be alive and well kicking it in Lore Lindu in 2008. Nearly 60 villages in the 2000 Sq km park are encroaching on the pint size primates mountain habitat, leaving their future uncertain. Your focus is people, plants, wildlife. How are the three related? ~Human activities are the main cause of modern day extinction of plants and wildlife. It’s poverty of the majority and human greed of the minority that are destroying our rainforests and wildlife. The indigenous people often turn to illegal activities such as poaching and logging in the Parks for fast cash.I have no political power to control the greed, so instead I focus on addressing poverty by providing quality and affordable health care. If we help them reduce their economic burden of health costs, the pressure on the forests will be less. Once mutual trust is established we can start a conversation about conservation and over time develop sustainable forest activities such as eco-tourism. I do believe it has great potential to succeed. We hear a lot of talk about deforestation but how does it really effect the rest of us? ~While only occupying one tenth of the world’s land mass tropical rainforests are home to half of the worlds species of plants and animals. These areas are teeming with potential life saving medicines. Some 120 prescription drugs are derived directly from rainforest plants and according to the U.S. National Cancer Institute, more than two-thirds of all medicines found to have cancer-fighting properties have been found in the flora and fauna of the earths threatened rain-forests. A now-extinct periwinkle plant found only in Madagascar (until deforestation wiped it out) increased the chances of survival for children with leukemia from 20 percent to 80 percent and Sulewasi is 2nd only to Madagascar in endemic plant and animal species! So the better question is how won’t deforestation of our planet effect the rest of us and the answer is…. Every single human begin from the local people who lose their ecosystem and traditional medicines to the child with leukemia, or the parent dying of cancer, even the woman who wants to reduce her wrinkles will be effected! Rainforest loss and the mass extinction of plants and animals is irreversible. Once they’re gone so are the hopes for a cure with them. * How can we help the Dr. ating foundation? ~ First and foremost we need funding to get off the ground. You can go to our website http://dratingfoundation.com/DrAting/Home.html to learn more about the foundation and how to make a donation. Another way people can contribute is by spreading the project news to potential donors or writing articles on the project on your blogs and in magazines. Lastly, people can contribute their time and energy by becoming volunteers at the project site. They can help provide health service or set up facilities for ecotourism and eco-education. To make sure the funds are being used properly, an independent auditing will be carried out every year. The donors will be sent the audit reports. So there you have it. Make a difference, make a donation, make a change so our children’s children have a home and so will the plants and animals. You can read the article on Dr. Ating in my very talented friends new Magazine Ember….. check it our from the link below. Ember is an ultra- cool new online magazine created by my super talented and dear friend Kate Samson and her equally talented partner Krystal. The magazine is packed full of fabulous photograph’s and articles on a variety of topics, sprinkled in are tips and trends in fashion, food, photography and more… My favorites in this issue are; My Camera, Your Home ( great pics and I love their style! ), Polly Armstrong- careful what you wish for ( this girl believed in herself and her dreams and is living the life she wanted!) and Alzheimer’s Symbol of Solitude ( a hauntingly beautiful photo essay by my good friend Anne)… What were yours? Give these amazing ladies some serious love… Subscribe to their magazine (free) and ” like” their Facebook page! You will be glad you did! Nice job Nic!! Hope all is well. Trying to do our part here. Human activities are hard to change in this small town. i want to place advertisement at your blog, but can’t find your email! Please contact me by email!